Yesterday was the fourth anniversary of Earl Grey Editing’s blog. I was a bit more prepared this year and ordered some special chocolates from Mornington Peninsular Chocolates to celebrate. 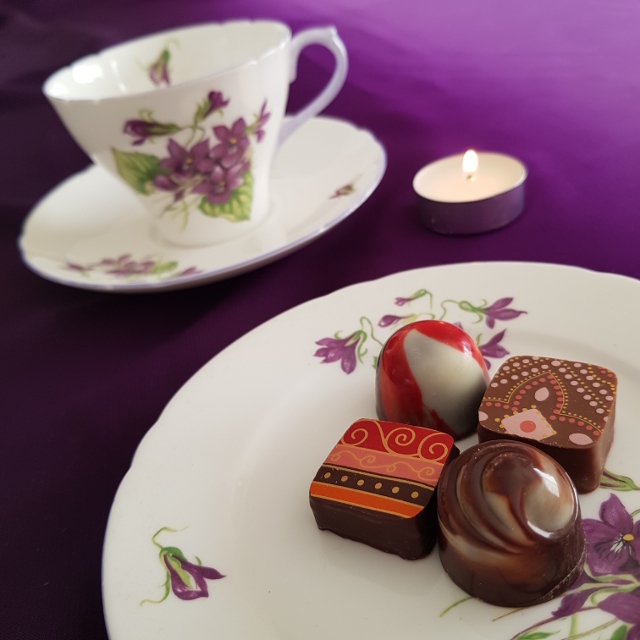 Pictured above (starting from the top and moving clockwise) are the raspberry ganache, French Earl Grey ganache, caramel swirl and chai ganache. Unsurprisingly, my favourite was the French Earl Grey ganache. After four years, I’m starting to feel like I’m properly established. Even like I’m part of the establishment. It feels kind of weird, since I’m used to thinking of myself as just starting out. I suppose it’s a kind of Impostor Syndrome. This year has certainly had its challenges. I had some issues with burnout back in March and subsequently scaled back to one post a week instead of two. This has been frustrating in some ways because there are so many awesome books I want to share with you all. However, the change eased some of the pressure on me and made blogging feel sustainable once again. There have also been things to celebrate. I was delighted to be nominated for the Ditmar Awards for the second year, and this time in two categories: Best Fan Writer and Best Fan Publication in Any Medium. Thank you so much to those that nominated and voted for me. On a slightly more personal note, I was thrilled to have a story accepted for publication in Mother of Invention, edited by Rivqa Rafael and Tansy Rayner Roberts. Although it wasn’t my first publication, it was my first that paid professional rates… and I get to share a table of contents with some of my favourite writers. This year I also started reviewing for The Skiffy and Fanty Show. It has been amazing to be part of such a talented team. Not only has it stretched me as a reviewer, but it has taught me a lot about podcasting and introduced me to some truly wonderful people. Thank you so much to everyone who reads regularly and those who have expressed support. I’m looking forward to continuing for another year. Thank you! It’s strange to think it has been four years already. It feels both longer and shorter than that. Happy Anniversary!! *throws confetti* The idea of chai ganache makes my mouth water. The chai ganache was indeed delicious. I was so glad to stumble across the chocolatier while attending Continuum in Melbourne last year. Thanks Paul! That means a lot to me coming from you. Any time I get stuck writing a review for Skiffy & Fanty, I always go and take a look at one of yours. A very happy blogging birthday to you, friend! I am so glad we are blogging friends and I wish you many happy returns of the day! Thank you so much! I’m super glad to have you as a blogging friend, too. Plus you and Whiskey Jenny never fail to make me smile whenever I’m listening to an episode of your podcast. You really brighten up my day.